1. I didn't get up until 11am...and I don't feel lazy or embarrassed about this. It felt so good to sleep in! 2. The husband left for California this morning. I have to admit, I am a tad jealous! 3. I made myself a bowl of cereal (Cheerios with honey on top) this morning only to discover we were out of milk. So, I used water instead...not the best of ideas I have had! 5. I bought this tiny little container of milk and it is so cute. 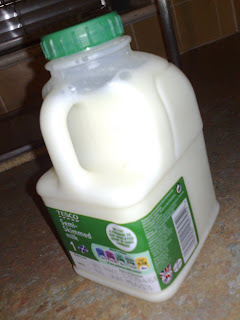 It has the exact shape of the regular milk, but only small...it's the little things that make me smile! And in case you were wondering, I bought the small milk that makes me smile after the unfortunate incident this morning. 7. I made a list of "to do's" for myself for the evening and I haven't even done half of them! This bad thing called a computer (or maybe we can blame it on the internet) sucked me in and distracted me! Well, I didn't quite make it to ten things...I didn't want to bore you with every detail...but you get the picture. The day was random, cloudy, yet still great...go Thursday!